Even though ubiquitination participates in most, if not all cellular processes, many questions in the field remain unanswered. These include questions regarding the basis of the ubiquitination process. The final step is carried out by the ubiquitin ligase (E3) which guides the modification of a substrate by bringing both the E2-ubiquitin conjugate and the substrate together. One of the outstanding questions concerns the regulation of the E3 ligase activity, in particular of single-unit E3 ligases of which there are more than 540 in Arabidopsis. Many U-box type E3 ligase such as PUB22, form signalling modules with different types of kinases, including receptor and mitogen-activated protein (MAP) kinases to regulate a plethora of celluar responses ranging from immunity to development. It remains largely unkown which type of ubiquitin chains are build by specific E3 ligases (e.g. 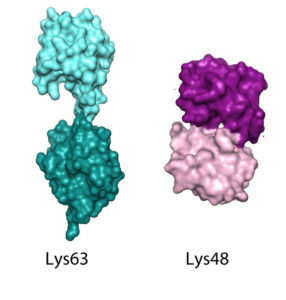 Lys63 or Lys48-linked chains). Ubiquitin is attached and linked in different ways, which constitutes the ubiquitin code, and determines the different fates of the modified protein, such as degradation or subcellular relocalization. The type of chain is largely determined by the E2 ubiquitin-conjugating enzymes. To uncover the biochemical activity of E3 ligases we developed tools to analyse E2-E3 pairing in vivo and identify physiological E2-E3 pairs.